Whew! As the above picture indicates I have at long last completed the arduous task of decorating the old homestead for Hallowe'en. My other scary tradition is to blare my big band albums while answering the door which has the effect of horrifying the should-have-stopped-trick-or-treating-already-teens who show up clamouring for candy. Candy conundrum: I can't resist the itty-bitty candy bars. They are so cute and tasty and non-caloric because of their itty-bittiness. They have no business being in my house, but if you wait to buy the stash at the last minute you risk being the house that gives out lousy candy. However, if the treats are in the house then they won't last until the big night. Oh, the horror! What if you got your husband to hide them? IS there anyone who can keep itty-bitty candy bars and actually have enough left to give the trick-or-treaters? I don't know anyone like that! 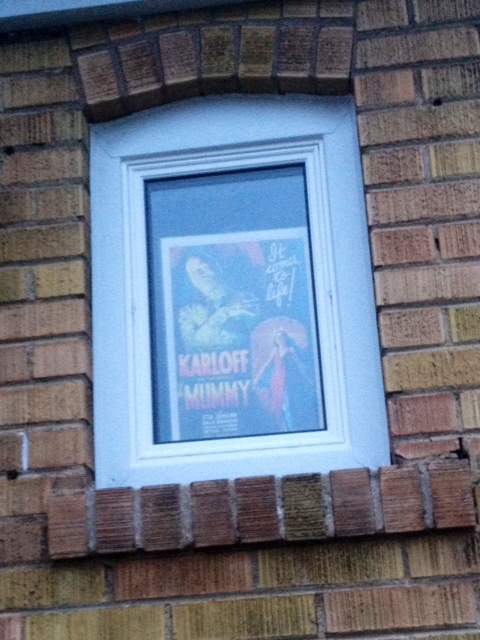 By the way, how much is that mummy in the window ... the one with the creepy lined face? I love those little candy bars, especially the "special dark chocolate." They are so low in calories you can eat twice as many. Do folks in Canada carve pumpkins? Rich, I could possibly get my husband to hide the candies, but then he'd forget which safe place he used! Becky, I'll be singing all day. When my mom was young she won a radio contest by knowing how many barks there were in Patty Page's hit song. I don't know what she won. It was all about the game. Readerman, pumpkin carving is quite big among Canucks. Spider webs on the porch. Ghosts hanging from trees. Zombies leaping out of the pile of leaves. Sound effects. The whole spooky-ookey ball of wax. I go for the more stream-lined approach to decorating. Also, as Marlene sang in "Stage Fright", "I'm the Laziest Gal in Town". Know what you mean, C.W. I had to run out and buy an extra bag of candy since SOMEHOW all the little peanut butter Snickers I'd planned for the kiddies (along with some other goodies) wound up empty. I just don't know HOW that happened. I don't even like peanut butter Snickers. Go figure. Well, what with the hurricane and all, maybe Halloween will be cancelled in town and I'll have to figure out how to get rid of the remaining candy all on my own. Hmmmmmmm......! I completely identify with the candy conundrum!! 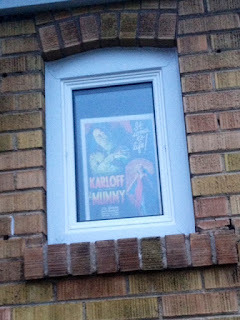 Also, good poster choice for the window. A classy way to decorate. We could use movie posters to decorate for all holidays. I think you're onto something. I love that your mother knew how many barks in the song. "How Much is that Doggy in the Window", I'm assuming, and not "Tennessee Waltz." My daughter gave me that poster as a birthday gift. I reckon she knows me pretty well. At Christmas I have a poster of "Holiday Inn" that lands somewhere and my youngest sister does the same thing with "White Christmas". It says to the world that movie lovers live here!